We had another busy day in class preparing for the robot competition, but also found time for dinner at the house of our Swiss instructor Michael where we enjoyed talking with his friends and seeing his robot lawn mower. 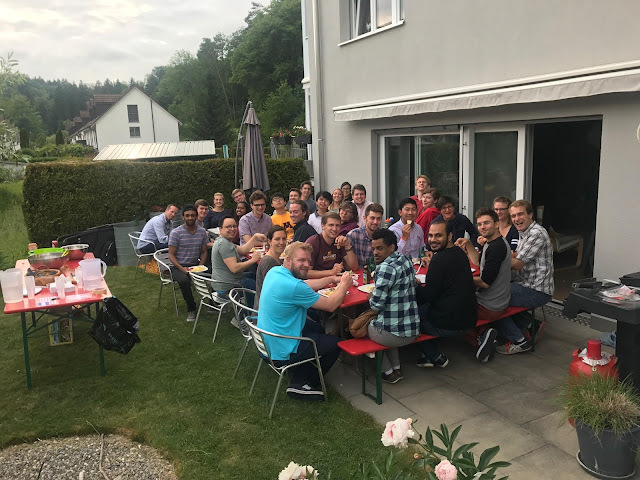 After another busy day in class preparing for the robot competition, our Swiss instructor Michael graciously invited us to his house for dinner, which is just a short minute train ride outside of Winterthur. His family and friends hosted us for brats, chips, dessert and drinks in a beautiful wooded residential area. We drank coffee while laughing and learning about cultural differences from our professor's friends. The Swiss values of hospitality, giving, and being present in the moment shined throughout the evening. Being that we Minnesotans are here for a mechatronics program with a competition in just a few short days, we discussed how to finish our robots and other similar topics. Michael enjoyed showing off his automatic lawn mower to us, like a Roomba Robot Vacuum, but for the lawn. We enjoyed this as well and gathered around, asking about the mechanisms and controls utilized. Overall it was a lovely evening, showing us the power of different cultures coming together and relaxing after a long day of school and work.